Currently every state has laws that make it illegal for items to fall from a vehicle while on the road. Most states’ penalties result in fines ranging from $10-$5,000 (Maine is $150-$500, New Hampshire is the court’s discretion & Vermont is $100+), with at least 16 states listing jail as a possible punishment for offenders. 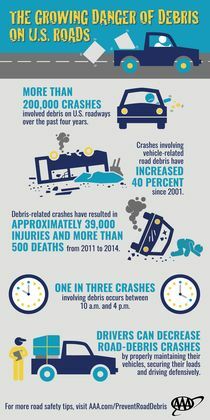 AAA encourages drivers to educate themselves about specific road debris laws in their state. Drivers should also practice defensive driving techniques while on the road to prevent debris related crashes from occurring.